I did sleep until 0900, maybe later. I awoke, quietly, on my own terms. No hustle of people getting up, dressing, packing, hoping to be first out the door. I awoke slowly, peacefully, without an ache or pain in my body. Fully rested. I went to breakfast and drank a pitcher of orange juice in 3 minutes, then asked for another. Delicious. I ate some of everything being offered. Yet, there were so many things I wanted to do that day. I forced myself to start moving. Leaving the hotel with a bag of everything fabric I had, I found the laundry in town that would wash, dry, fold, and deliver my laundry to the hotel. I found a Vodaphone store and put minutes on my phone, finally. I wanted to see all the great sights. I wanted to see the world-famous Cathedral. I also wanted to see the Monasterio de Las Huelgas Reales. This monastery was founded in 1187 by royalty, many of whom were crowned and later buried there. But the big draw is that the monastery has a statue of Santiago, St. James, with a moving arm. This arm was used to bestow knighthoods on lucky recipients. The draw of classic cloister architecture, a statue with a moving arm, and the beauty of a bright, dry day was an irresistible combination and I was off. As I followed my map, I ran into several friends from the Camino and I spent time with them. 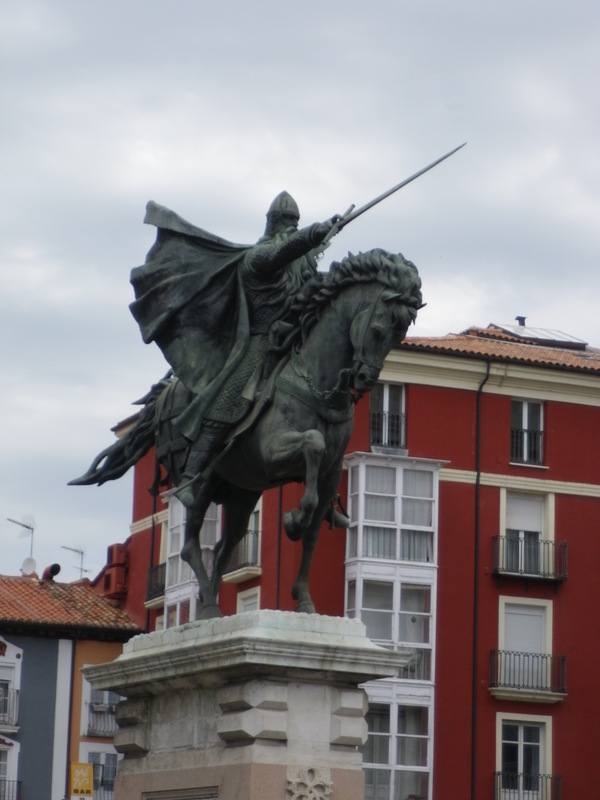 I admired the many statues of El Cid, a favorite son of the city. 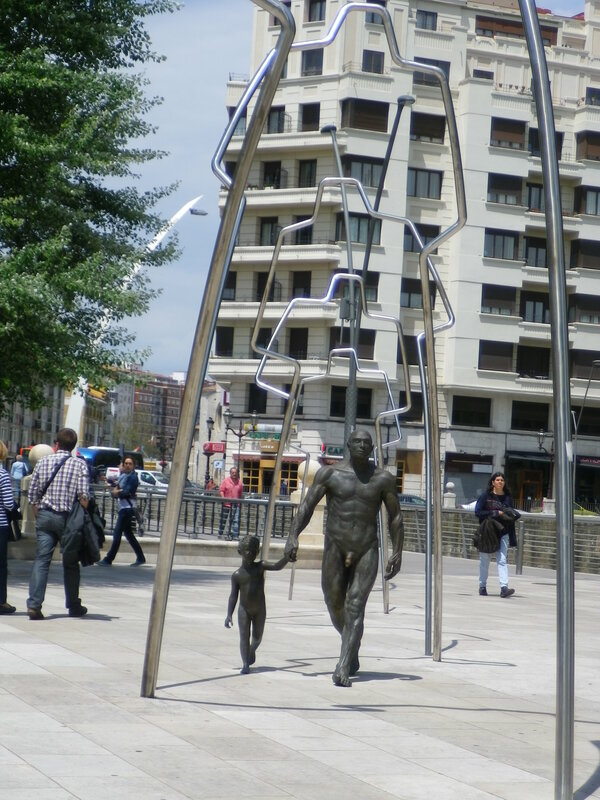 The gardens along the river were lovely and the new Museum of Human Evolution was very enticing. Should I visit? Do I have time? Money? Each new sight drew me away from my goal of finding the monastery as I wandered happily around Burgos. I finally decided to get back on track and find that monastery. I eventually saw what I was looking for across the river – an old building, small, unassuming, faced by trees and, what else, a parking lot. I approached, read the plaque on the wall, and came to a shocking halt, unable to believe what my eyes were telling me. I had not found the monastery founded by Alfonso VIII and his peers, with a statue that could bestow knighthoods. 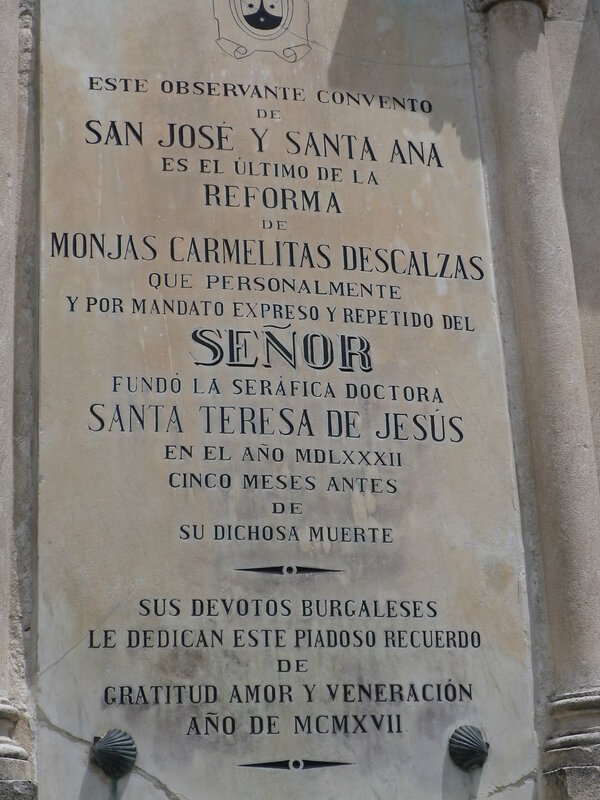 I had, instead, stumbled upon a convent founded by my traveling companion, Saint Theresa. 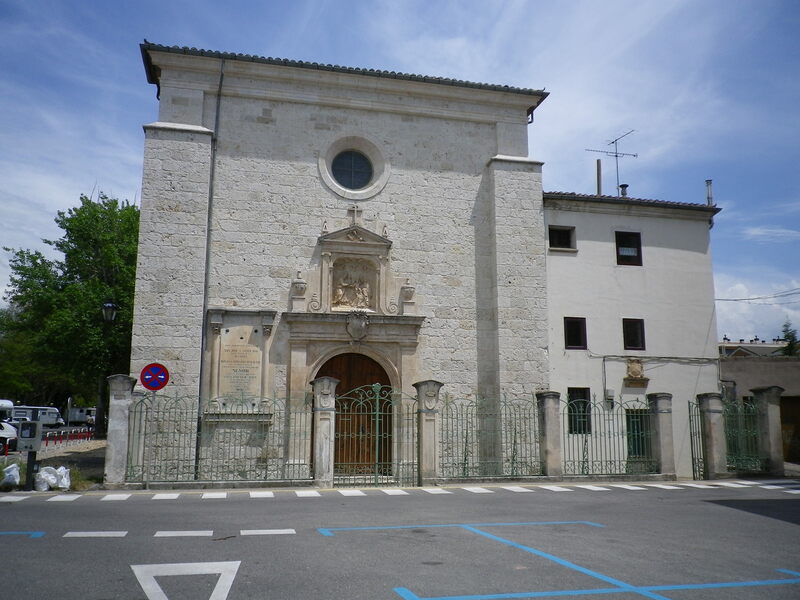 In fact, the last convent founded by Saint Theresa before her death in 1582. My companion, Big Tess, who had been guiding my steps from day one of my Camino, had led me through the city, admiring the sights, and taken me straight to her house. I checked my map, and sure enough, this convent wasn’t listed. In other words, if I had been looking for it, I would not have been able to find it. I realized that I had been so caught up in myself, my journey, my well-being and comfort, that I had forgotten to say “thank you” to my true traveling companions, my Saints – Big Tess, who had given me the gumption to walk away from people who made me feel bad about myself, St. Julian who had led me to the great hotel room, St. Christopher, who put me on the right bus, St Roque, who kept my feet in great shape, and St. Philip N, who saw that I always had a reason for a smile on my face. I spent quite a bit of time sitting in the parking lot, resting and thinking. 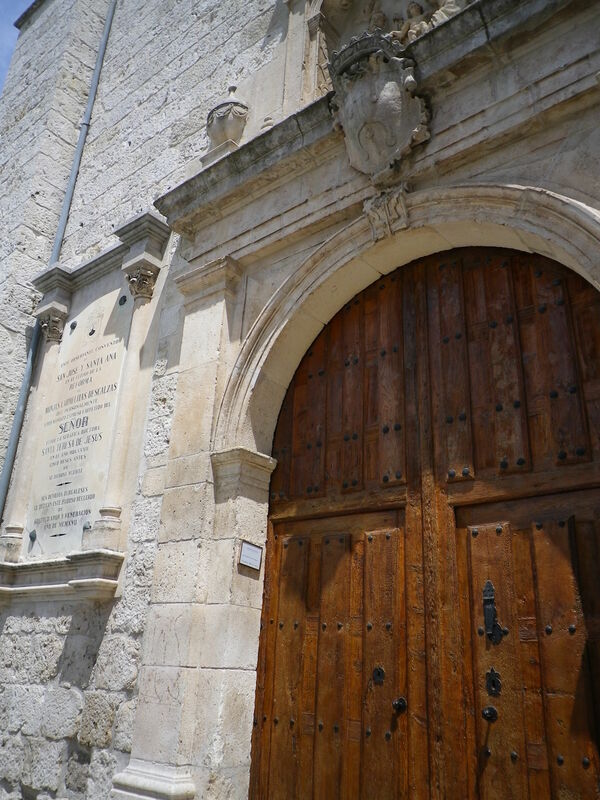 I watched as a young woman carrying a suitcase walked up and rang the bell of the convent. A woman opened the door and gave a warm, “Ah, we’ve been expecting you! Welcome!” to the new arrival. I felt happy for all parties involved. I gave up my plans to look for the famous monastery with the statue with the moving arm. I had found a more important sight. 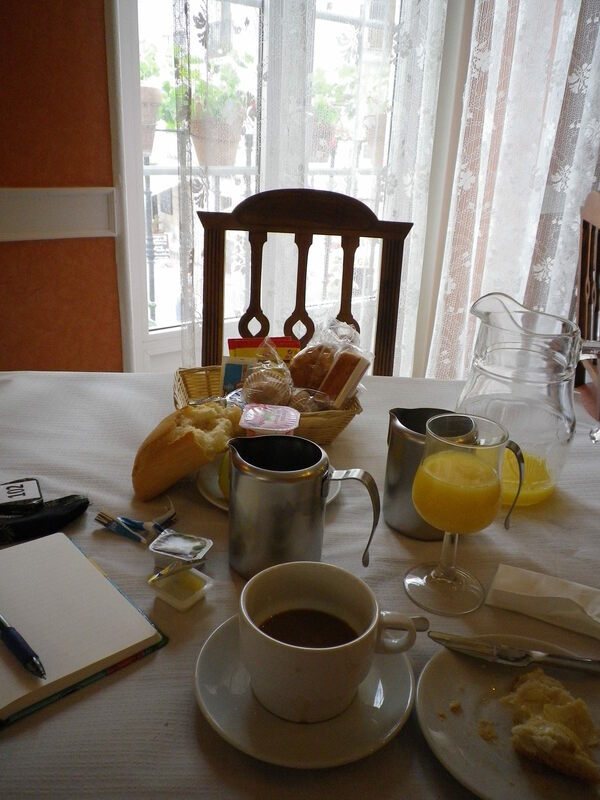 This entry was posted in camino de santiago de campostella, Religion, Travel and tagged backpack, Camino de Santiago de Campostella, Catholic Church, Saints, Spain, Travel. Bookmark the permalink. Hi, Anne! What a lovely comment. Thank you. I also realized that this was a great example of St. Philip N, the “funny saint,” playing with me. Like when the sun comes out right after I finish struggling to get the rain cover on my backpack. One of the main lessons to be learned is that we are NEVER truly in control, as you said much more eloquently. Hello Kathy. I have been reading your blog and following your progress from way down south on Oz.